I am really excited to share with you this week's Local Vendor We Love! Taken from Rais Case About Page, here is her story! "Owner, Julie Rais Ellis, was a teacher when she started this journey. In August 2010, with $200 she bought a sewing machine and some fabric with a simple desire to make a bag for her computer, what she discovered was a deep joy for making practical goods. With no formal training in sewing or design, Julie found ways to use her background in art to guide her through the process. What began as a personal project, quickly turned into a hobby, and slowly evolved into a study of quality, design, and fashion. As she honed her skills and let her ideas take shape she decided to call her collection 'Rais Case'. After four years of hard work, many sleepless nights, farmers markets, craft shows, and a healthy dose of determination, Julie started to see how much Rais Case had grown. In January of 2014, it was clearly becoming too hard to juggle being a teacher and running the business. Julie realized it was time to take a leap of faith and leave her job as an art teacher so she could dedicate more time and energy to Rais Case. She decided to embark on her dream of a brick and mortar co-op space where her vision of collaboration and process work could come to life. 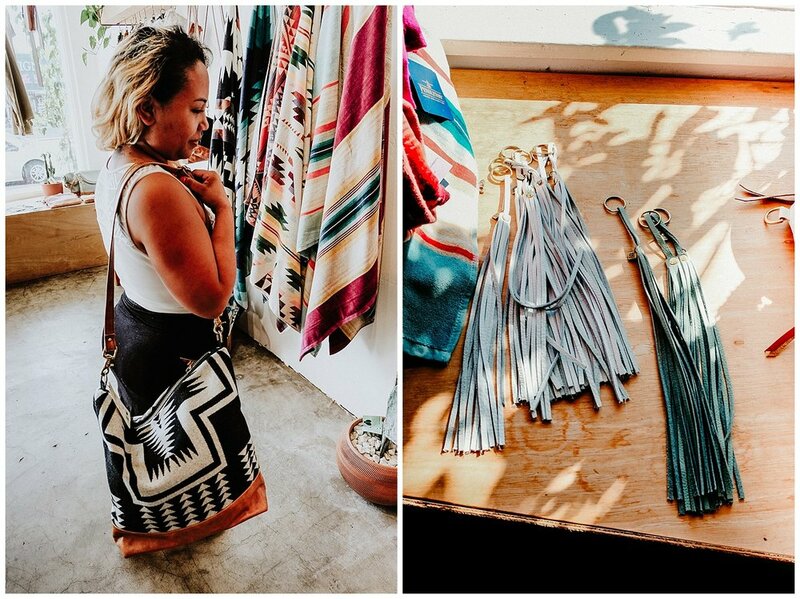 Now, in partnership with fellow artisan, Mr. B's Luminaries, they run the collective retail space/studio in Oceanside and host a number of other local, ethically produced brands. One of the shop's unique features is a DIY table, where customers can drop in anytime to repurpose leather waste into beautiful crafts. The textiles within this quaint little shop stimulate the senses in an unexpected way! I had so much fun capturing just a few fun snapshots you see above of Julie's gorgeous work! If you are located in the San Diego area you MUST take a moment to visit! She will not disappoint! Thank you Julie for making such beautiful wearable art for us to enjoy!